Oxyntomodulin regulates resetting of the liver circadian clock by food. Circadian clocks coordinate 24-hr rhythms of behavior and physiology. In mammals, a master clock residing in the suprachiasmatic nucleus (SCN) is reset by the light-dark cycle, while timed food intake is a potent synchronizer of peripheral clocks such as the liver. Alterations in food intake rhythms can uncouple peripheral clocks from the SCN, resulting in internal desynchrony, which promotes obesity and metabolic disorders. 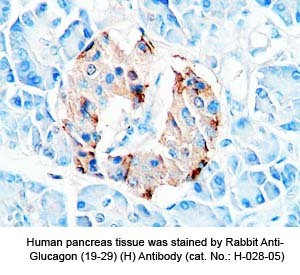 Pancreas-derived hormones such as insulin and glucagon have been implicated in signaling mealtime to peripheral clocks. In this study, we identify a novel, more direct pathway of food-driven liver clock resetting involving oxyntomodulin (OXM). In mice, food intake stimulates OXM secretion from the gut, which resets liver transcription rhythms via induction of the core clock genes Per1 and 2. Inhibition of OXM signaling blocks food-mediated resetting of hepatocyte clocks. These data reveal a direct link between gastric filling with food and circadian rhythm phasing in metabolic tissues. Landgraf D, Tsang AH, Leliavski A et al., Elife. 2015 Mar 30;4:e06253. doi: 10.7554/eLife.06253. Rise of oxyntomodulin in response to oral glucose after gastric bypass surgery in patients with type 2 diabetes. CONTEXT: The mechanisms by which Roux-en-Y gastric bypass surgery (GBP) results in sustained weight loss and remission of type 2 diabetes are not fully understood. OBJECTIVE: We hypothesized that the anorexic hormone oxyntomodulin (OXM) might contribute to the marked weight reduction and the rapid improvement in glucose metabolism observed in morbidly obese diabetic patients after GBP. METHODS: Twenty obese women with type 2 diabetes were studied before and 1 month after GBP (n=10) or after a diet-induced equivalent weight loss (n=10). Patients from both groups were matched for age, body weight, body mass index, and diabetes duration and control. OXM concentrations were measured during a 50-g oral glucose challenge before and after weight loss. RESULTS: At baseline, OXM levels (fasting and stimulated values) were indistinguishable between the GBP and the diet group. However, OXM levels rose remarkably in response to an oral glucose load more than 2-fold (peak, 5.25+/-1.31 to13.8+/-16.2 pmol/liter; P=0.025) after GBP but not after diet. The peak of OXM after glucose was significantly correlated with glucagon-like peptide-1 and peptide YY3-36. CONCLUSIONS: Our data suggest that the observed changes in OXM primarily occur in response to GBP and not as a consequence of weight loss. These changes were observed early after surgery and occurred in parallel with previously reported increases in incretins and peptide YY. We speculate that the combination of gut hormone changes is essential for the improved glucose homeostasis and may partially explain the success of this surgery on diabetes resolution and weight loss. Laferrère B, Swerdlow N, Bawa B et al., J Clin Endocrinol Metab. 2010 Aug;95(8):4072-6. doi: 10.1210/jc.2009-2767. Epub 2010 May 25. Gastrointestinal hormones and bariatric surgery-induced weight loss. ABSTRACT: Obesity continues to be a major public health problem in the United States and worldwide. While recent statistics have demonstrated that obesity rates have begun to plateau, more severe classes of obesity are accelerating at a faster pace with important implications in regards to treatment. Bariatric surgery has a profound and durable effect on weight loss, being to date one of the most successful interventions for obesity. OBJECTIVE: To provide updates to the possible role of gut hormones in post bariatric surgery weight loss and weight loss maintenance. DESIGN AND METHODS: The current review examines the changes in gastro-intestinal hormones with bariatric surgery and the potential mechanisms by which these changes could result in decreased weight and adiposity. RESULTS: The mechanism by which bariatric surgery results in body weight changes is incompletely elucidated, but it clearly goes beyond caloric restriction and malabsorption. CONCLUSION: Changes in gastro-intestinal hormones, including increases in GLP-1, PYY, and oxyntomodulin, decreases in GIP and ghrelin, or the combined action of all these hormones might play a role in induction and long-term maintenance of weight loss. Ionut V, Burch M, Youdim A, Obesity (Silver Spring). 2013 Jun;21(6):1093-103. doi: 10.1002/oby.20364. Gastrointestinal hormones: the regulation of appetite and the anorexia of ageing. Loss of appetite is frequently observed during ageing, termed the 'anorexia of ageing'. Ageing is associated with the inability to appropriately increase food intake after under-eating in the short- and long-term. Older people also report lower feelings of hunger and increased feelings of satiety and fullness. Gastrointestinal peptide hormones are a major part of the appetite regulatory system and are released in response to nutritional stimuli. They can be classified as: anorexigenic (satiety) [e.g. peptide tyrosine tyrosine (PYY), glucagon-like peptide-1, pancreatic polypeptide,oxyntomodulin and cholecystokinin (CCK)] or orexigenic (hunger) (e.g. ghrelin). Although the control of appetite is not fully understood, it is clear that these hormones play an important role, and may influence the development and treatment of obesity and under-nutrition. The literature shows a consistent finding that there is a loss of appetite in those aged over 65 years, although how this loss is mediated is not yet clear. Some evidence suggests that with advancing age there is an increase in satiety hormones, such as CCK and PYY, and a decrease in the hunger hormone, ghrelin. However, not all studies agree, emphasising the need for more in-depth research to clarify age-related changes. This knowledge will enable us to develop therapies to help prevent under-nutrition during ageing. This review explores how age influences gastrointestinal appetite hormones in humans, as well as how this may contribute to the development of age-related malnutrition. Moss C, Dhillo WS, Frost G, Hickson M, J Hum Nutr Diet. 2012 Feb;25(1):3-15. doi: 10.1111/j.1365-277X.2011.01211.x. Epub 2011 Nov 26. The role of oxyntomodulin and peptide tyrosine-tyrosine (PYY) in appetite control. Oxyntomodulin and peptide tyrosine-tyrosine (PYY) are released from intestinal enteroendocrine cells in response to a meal. These circulating hormones are considered to be satiety signals, as they have been found to decrease food intake, body weight and adiposity in rodents. 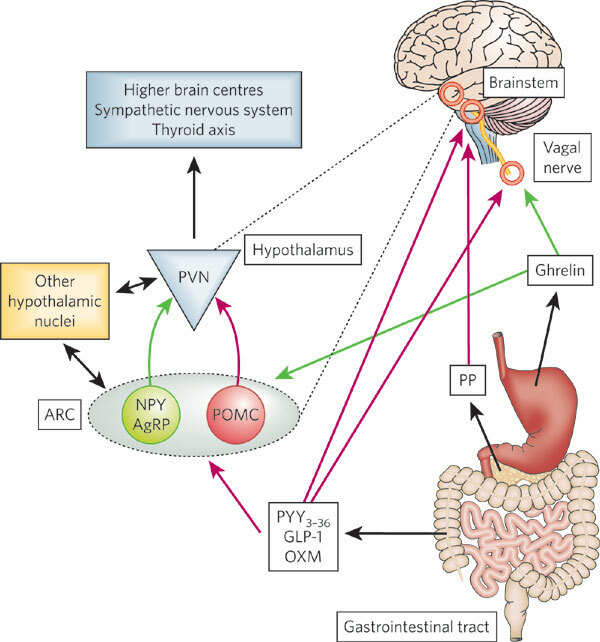 Their effect on energy homeostasis is mediated by the hypothalamus and brainstem, and several studies have demonstrated alterations in neuropeptide signaling within the arcuate nucleus. The weight loss that has been observed in animal models after repeated administration of oxyntomodulin and PYY has led to interest in developing these peptides as antio-besity therapies in humans. Indeed, preliminary studies have found that oxyntomodulinor PYY administration reduces food intake and body weight effectively in overweight human volunteers. This research suggests that modulation of these gut hormones could prove to be effective long-term therapies in the quest to combat the obesity epidemic. Wynne K, Bloom SR, Nat Clin Pract Endocrinol Metab. 2006 Nov;2(11):612-20. Specificity and sensitivity of commercially available assays for glucagon and oxyntomodulin measurement in humans. AIM: To determine the specificity and sensitivity of assays carried out using commercially available kits for glucagon and/or oxyntomodulinmeasurements. METHODS: Ten different assay kits used for the measurement of either glucagon or oxyntomodulin concentrations were obtained. Solutions of synthetic glucagon (proglucagon (PG) residues 3361), oxyntomodulin (PG residues 3369) and glicentin (PG residues 169) were prepared and peptide concentrations were verified by quantitative amino acid analysis and a processing-independent in-house RIA. 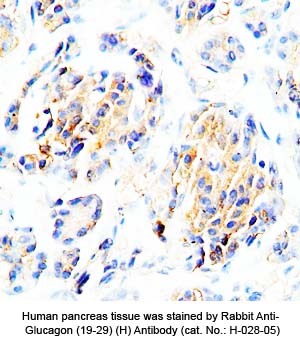 Peptides were added to the matrix (assay buffer) supplied with the kits (concentration range: 1.25-300 pmol/L) and to human plasma and recoveries were determined. Assays yielding meaningful results were analysed for precision and sensitivity by repeated analysis and ability to discriminate low concentrations. RESULTS AND CONCLUSION: Three assays were specific for glucagon (carried out using the Millipore (Billerica, MA, USA), Bio-Rad (Sundbyberg, Sweden), and ALPCO (Salem, NH, USA) and Yanaihara Institute (Shizuoka, Japan) kits), but none was specific for oxyntomodulin. 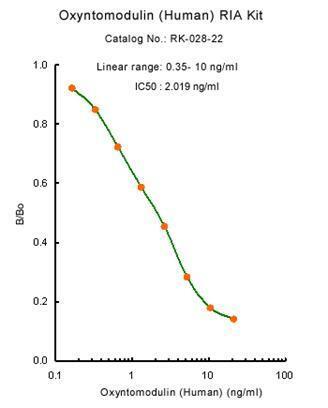 The assay carried out using the Phoenix (Burlingame, CA, USA) glucagon kit measured the concentrations of all three peptides (total glucagon) equally. 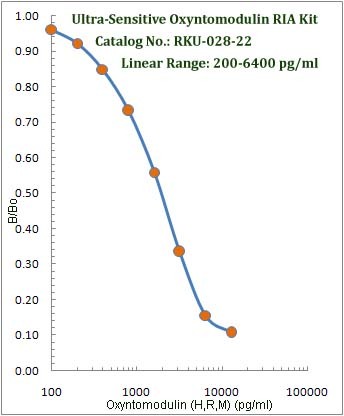 Sensitivity and precision were generally poor; the assay carried out using the Millipore RIA kit performed best with a sensitivity around 1p pmol/L. Assays carried out using the BlueGene (Shanghai, China), USCN LIFE (Wuhan, China) (oxyntomodulin and glucagon), MyBioSource (San Diego, CA, USA) and Phoenix oxyntomodulin kits yielded inconsistent results. PS. (1) for the recovery of Oxyntomodulin. The free and thaw process in this study can be a main reason for the observed variation in the amount of oxyntomodulin because the variation of endogenous prepro-glucagon and non-specific binding protein has effect on the accuracy of oxyntomodulin assays. (2) for the specific recognization of Oxyntomodulin. Oxyntomodulin is a 37 amino acid peptide that contains the 29 amino acid sequence of glucagon followed by an 8 amino acid carboxyterminal extension. If the immunoassays using the antibody that are not specific for both the C-and N-terminus of oxyntomodulin will also cross-react with glucagon, and possibly glicentin. Hence much of the earlier literature assessing circulating oxyntomodulin using non-specific assays may not be accurate. Bak MJ, Albrechtsen NW, Pedersen J et al., Eur J Endocrinol. 2014 Mar 8;170(4):529-38. doi: 10.1530/EJE-13-0941. Print 2014 Apr. Oxyntomodulin (OXM) is a circulating gut hormone released post-prandially from cells of the gastrointestinal mucosa. Given intracerebroventricularly to rats, it inhibits food intake and promotes weight loss. Here we report that peripheral (intraperitoneal; IP) administration of OXM dose-dependently inhibited both fast-induced and dark phase food intake without delaying gastric emptying. Peripheral OXM administration also inhibited fasting plasma ghrelin. In addition, there was a significant increase in c-fos immunoreactivity, a marker of neuronal activation, in the arcuate nucleus (ARC). 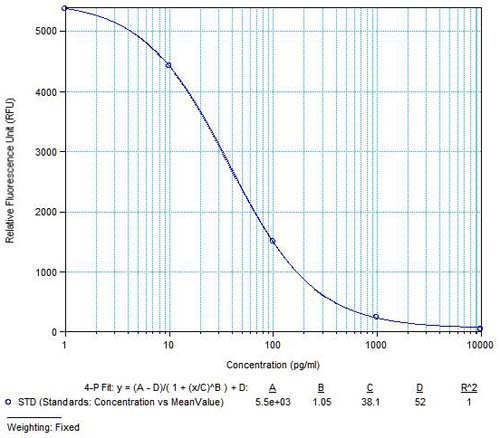 OXM injected directly into the ARC caused a potent and sustained reduction in refeeding following a fast. 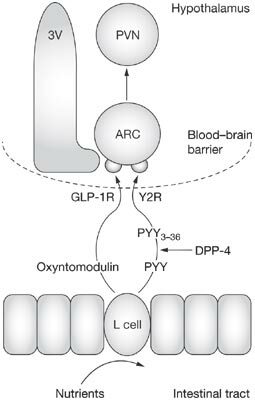 The anorectic actions of IP OXM were blocked by prior intra-ARC administration of the GLP-1 receptor antagonist, exendin9-39, suggesting that the ARC, lacking a complete blood-brain barrier, could be a potential site of action for circulating OXM. The actions of IP GLP-1, however, were not blocked by prior intra-ARC administration of exendin9-39, indicating the potential existence of different OXM and GLP-1 pathways. Seven-day IP administration of OXM caused a reduction in the rate of body weight gain and adiposity. Circulating OXM may have a role in the regulation of food intake and body weight. Dakin et al. Endocrinology. 2004 Jun;145(6):2687-95. Oxyntomodulin (OXM) is released from the gut postprandially, in proportion to energy intake, and circulating levels of OXM are elevated in several conditions associated with anorexia. Central injection of OXM reduces food intake and weight gain in rodents, suggesting that OXM signals food ingestion to hypothalamic appetite-regulating circuits. We investigated the effect of iv OXM (3.0 pmol/kg.min) on appetite and food intake in 13 healthy subjects (body mass index, 22.5 0.9 kg/m(2)) in a randomized, double-blind, placebo-controlled, cross-over study. Infusion of OXM significantly reduced ad libitum energy intake at a buffet meal (mean decrease, 19.3 ?5.6%; P < 0.01) and caused a significant reduction in scores for hunger. In addition, cumulative 12-h energy intake was significantly reduced by infusion of OXM (mean decrease, 11.3 ?6.2%; P < 0.05). OXM did not cause nausea or affect food palatability. Preprandial levels of the appetite-stimulatory hormone, ghrelin, were significantly suppressed by OXM (mean reduction, 44 ?10% of postprandial decrease; P < 0.0001). Elevated levels of endogenous OXM associated with disorders of the gastrointestinal tract may contribute to anorexia. Infusion of OXM elevated plasma OLI from 62 ?5 pmol/liter ( 275.89 ?22. 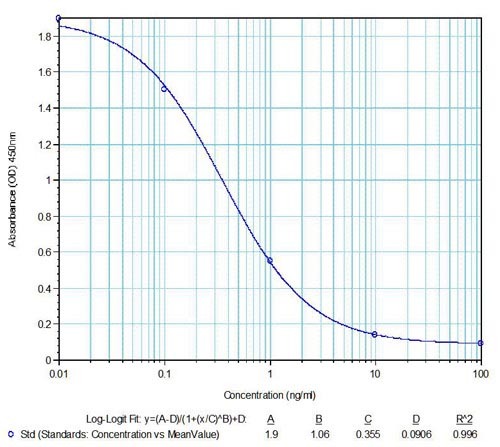 24 pg/ml ) to a peak of 907 ?32 pmol/liter ( 4036.06 ?142.39 pg/ml) at t60 . In comparison, on the saline infusion day, consumption of the buffet meal led to a peak postprandial OLI level of 151 ?18 pmol/liter at 195 min. Gel permeation analysis of plasma samples during OXM infusion demonstrated a single immunoreactive peak eluting in the same position as synthetic OXM (Kav = 0.6). Thus, intact full-length OXM was the principle circulating form. Cohen et al. J Clin Endocrinol Metab. 2003 Oct;88(10):4696-701. 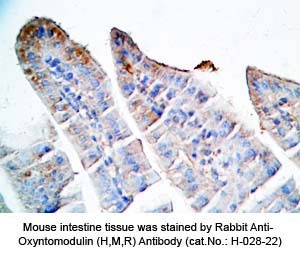 Oxyntomodulin and peptide tyrosine-tyrosine (PYY) are released from intestinal enteroendocrine cells in response to a meal. These circulating hormones are considered to be satiety signals, as they have been found to decrease food intake, body weight and adiposity in rodents. Their effect on energy homeostasis is mediated by the hypothalamus and brainstem, and several studies have demonstrated alterations in neuropeptide signaling within the arcuate nucleus. The weight loss that has been observed in animal models after repeated administration of oxyntomodulin and PYY has led to interest in developing these peptides as antiobesity therapies in humans. Indeed, preliminary studies have found that oxyntomodulin or PYY administration reduces food intake and body weight effectively in overweight human volunteers. This research suggests that modulation of these gut hormones could prove to be effective long-term therapies in the quest to combat the obesity epidemic. Wynne et al. Nat Clin Pract Endocrinol Metab. 2006 Nov;2(11):612-20. Oxyntomodulin is derived from proglucagon processing in the intestine and the central nervous system. To date, no role in the central nervous system has been demonstrated. We report here that oxyntomodulin inhibits refeeding when injected intracerebroventricularly and into the hypothalamic paraventricular nucleus of 24-h fasted rats [intracerebroventricularly and into the paraventricular nucleus, 1 h, oxyntomodulin (1 nmol), 3.1 ?0.5 g; saline, 6.2 ?0.4 g; P < 0.005]. In addition, oxyntomodulin inhibits food intake in nonfasted rats injected at the onset of the dark phase (intracerebroventricularly, 1 h: oxyntomodulin, 3 nmol, 1.1 ?0.19 g vs. saline, 2.3 ?0.2 g; P < 0.05). This effect of oxyntomodulin on feeding is of a similar time course and magnitude as that of an equimolar dose of glucagon-like peptide-1. Other proglucagon-derived products investigated [glucagon, glicentin (intracerebroventricularly, 3 nmol; into the paraventricular nucleus, 1 nmol), and spacer peptide-1 (intracerebroventricularly and into the paraventricular nucleus, 3 nmol)] had no effect on feeding at any time point examined. The anorectic effect of oxyntomodulin (intracerebroventricularly, 3 nmol; into the paraventricular nucleus, 1 nmol) was blocked when it was coadministered with the glucagon-like peptide-1 receptor antagonist, exendin-(9-39) (intracerebroventricularly, 100 nmol; into the paraventricular nucleus, 10 nmol). However, oxyntomodulin has a lower affinity for the glucagon-like peptide-1 receptor compared with glucagon-like peptide-1 (IC(50): oxyntomodulin, 8.2 nM; glucagon-like peptide-1, 0.16 nM). One explanation for this is that there might be an oxyntomodulin receptor to which exendin-(9-39) can also bind and act as an antagonist.